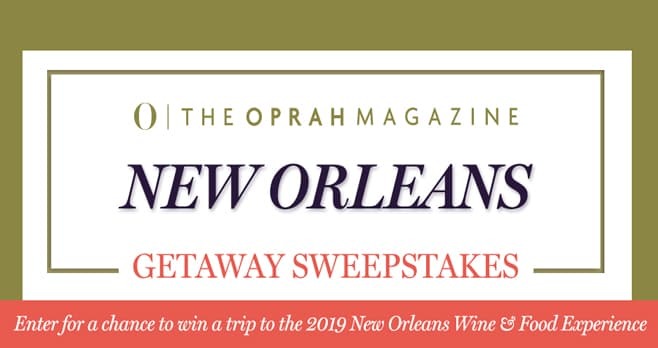 The Oprah Magazine is sending one lucky reader on a trip to the 2019 New Orleans Wine & Food Experience with the Oprah Magazine New Orleans Wine & Food Experience Sweepstakes. Register now at oprah.com/nola for your chance to win the grand prize trip valued at over $7,000. The Oprah Magazine New Orleans Wine & Food Experience Sweepstakes is open to legal residents of the 50 United States and the District of Columbia, who have reached the age of 21 in their state or territory of residence at time of entry. Legal residents of Canada (excluding Quebec) who have reached the aforementioned age in their province of residence at time of entry are also eligible to enter. The Sweepstakes begins January 2, 2019, at 12:01 AM (ET) and ends February 13, 2019, at 11:59 PM (ET). Limit one (1) entry per person for Sweepstakes. The grand prize consists of a trip to the 2019 New Orleans Wine & Food Experience, currently scheduled for April 3-7, 2019 in New Orleans, L.A. Visit oprah.com/nola to enter and see Official Rules for details. Love New Orleans, would love to win.